Background: The complex life cycle of malarial parasite limits the efficacy of vaccine based on a single protein. The optimal strategy to design a viable vaccine should consider a selection of antigens from different stages of the parasite’s life cycle. In addition to multi-stage complexity, the synthetic or recombinant vaccine could not elicit a suitable immune response because it lacks important elements of the native architecture such as post-translational modifications. Objective: The Plasmodium falciparum Merozoite Surface Protein 2 (PfMSP2) is one of the suitable vaccine candidates, due to its presence on merozoite surface after the invasion of erythrocytes. The humoral response against O-linked glycosylated PfMSP2 is expected to interfere with erythrocyte invasion and propagation of merozoites. Prevention of parasite invasion to human erythrocytes can efficiently reduce the spread and development of this infectious agent. 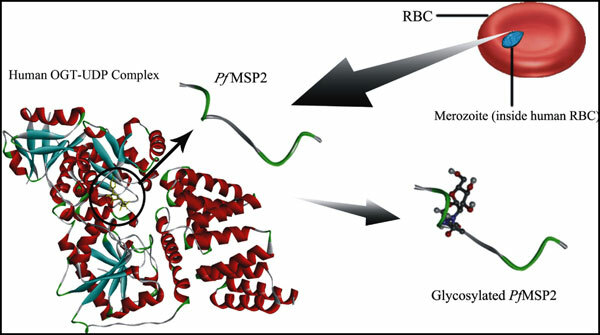 Method: The PfMSP2 bears potential glycosylation sites and the human erythrocytic O-linked Nacetylglucosamine transferase (OGT) could glycosylate PfMSP2 through combinatorial metabolism. This hypothesis was tested by generating binding models of PfMSP2 and human OGT complexed with UDP-GlcNAc via protein-protein docking. The docking experiment was followed by the binding of OGlcNAc at the hydroxyl group of potential modification sites in PfMSP2. Results: The binding complex of PfMSP2 with human OGT shows the interaction between key residues and affirms the transfer of O-GlcNAc to the N-terminal domain of PfMSP2. The potential glycosylation site in PfMSP2 is Ser19 that is present in conserved N-terminal domain. The glycosylated Ser19 exhibits different orientation and induced structural alteration in the immunogenic region of PfMSP2. Conclusion: Our findings suggest that PfMSP2 shows potential for glycosylation at Ser19 and this modified PfMSP2 may constitute more appropriate antigen for the developing a protective immune response against malaria. merozoite Surface Protein 2, O-linked N-acetyl glucosamine, post translational modification, malaria vaccine, erythrocytic stage of Plasmodium falciparum, 3D structural modelling, protein-protein docking, immunogenicity.